Cleansing Crystals For Positive Energy! Why Should You Cleanse Your Crystals? Cleansing crystals regularly is necessary as they will absorb negative energy. This is why it is a good idea to purify them on a regular basis. It is likely that your crystals may absorb vibrations not only from you, but from anything in the environment where they are located. So check out the list below of ways to boost their energy. To create positive energy within your crystals, you need to cleanse them frequently. This is important as their effectiveness for healing may be effected by negative vibrations within them. If you have been using them to heal health issues or when you were in a negative frame of mind, they would probably have absorbed your negative energy. Are You Cleansing Your Crystals? If you have been thinking about why you should cleanse your crystals, and you use them regularly, understand that your crystals are tools. You need these tools to be at the highest vibration possible. This way you receive the most benefit from using them. Its just a matter of learning about the methods to clean your stones. Cleanse them on a regular basis to keep them full of positive energy. Many people go to great lengths to clean their home, their clothes and themselves, yet neglect to remove the negativity from the crystals they are using. Its easy to do, simply learn how! 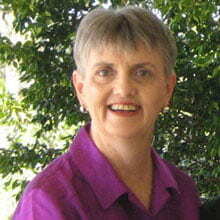 See the list of ways to cleanse or energize your crystals, healing stones or gemstone jewelry. Cleansing crystals by smudging them is easy. So how do you smudge crystals? The most potent smudge to use is white sage. 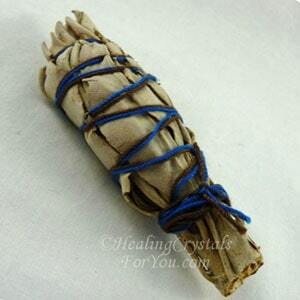 It is easy to buy in most places, and the smudge sticks are made up of either white sage alone or mixed with lavender. Some may have other fragrant herbs in them as well. Some of these may also have healing attributes that could benefit you. Sage smoke is powerful to cleanse both your stones and the environment where they live. You can do this one of two ways. You can hold the stones close to the stream of the smoke, or simply hold your smudge stick near to where they are sitting so the air around them is full of the sage essence. Use a fire-proof ceramic bowl to hold the smoking sage, to avoid accidents. This is the method most alchemical healers use, to quickly cleanse their stones and crystal wands after use on clients. Cleaning your crystals with water is not recommended unless you know about whether you stone is safe to cleanse this way. If you are cleaning quartz crystals, generally this will be safe. But please take care when using water on large clusters, as they may still be harmed by water, so do it with care. If you do not know much about crystals, avoid using water to clean them. Some crystals may be totally ruined by contact with water, so use other methods of cleansing crystals unless you are absolutely sure. There are different methods for cleansing natural crystals of various types. Using white light is a powerful method once you know how to create it. Most of you have the capacity to create white light, and this may also be called universal light. The first time you do it, close your eyes and ask the universe or spirit, or whatever you believe in to be the creator, to create white light. This is similar to the power of prayer. Imagine your body filling with the light, then feel the added energy that you have within you. Open your eyes and direct the white light. Use your hands in a small sweeping motion towards where you want to direct the white light. White light is the easiest and most effective method to remove any built up negative energy quickly. Ask the universe to use the white light to transmute any negative energy within the stone into positive energy. You can also use it to improve the energy of the room and to bring healing. Not only can this method be used for cleansing crystals, the white light can also be used on yourself to bring your vibration up. I like to cleanse my personal stones fairly often, and this is especially important if you are doing a daily meditation with crystals and using them. Using sound is a really easy way to cleanse and activate your crystals. I have a crystal singing bowl, a rather large one that resonates to the vibration of the sacral chakra. A crystal singing bowl may be used to cleanse your crystals. There are two ways to do this. If the stones are small you may put them into the crystal singing bowl. For bigger items, place them close to the bowl, then play the bowl for a few minutes. The lovely crystal bowl music is very powerful for cleansing crystals and the sounds emitted by the bowl will resonate throughout the room activating any stones in the area. It is excellent to use, but is quite big so is harder to move from room to room. As the strong vibration of the pure crystalline sound of your crystal singing bowl fills the crystals, it will drive out any negative energy. The sound will lift the vibration of any of your crystals that are close by, and the room will also be filled with good vibrations as well. I love playing my crystal bowl to lift the vibration of my home, as it resonates a powerful energy into its surroundings. An alternative way to use sound for activating and cleansing crystals, is to use Tingsha hand cymbals also known as Tibetan chimes. They are so easy to use, are small and quite light and can be easily picked up and taken from room to room. They resonate with a high vibration, that will cleanse any crystals in the vicinity, and as well will clear any negative energy in the room as well as activating the energy of crystals nearby. A friend and I were visiting the Crystal Castle near Byron Bay in NSW Australia, and we met with some monks who were doing a lovely meditation using Tingsha chimes also called Tibetan chimes. The monks demonstrated how to use the lovely Tingsha hand cymbals they were selling. 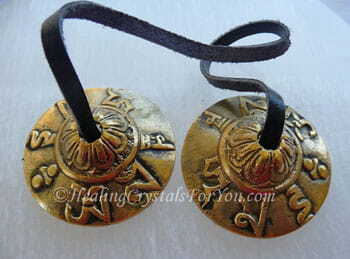 Tibetan chimes are potent aids to clear your energy and may also be used prior to meditation. It is as simple as moving them while holding the leather band and allowing them to touch together and ring out their amazing high pitched sound. The sound that emanates from them is powerful to assist you to relax and will also clear any disharmony from any stones you may choose to use in meditation. 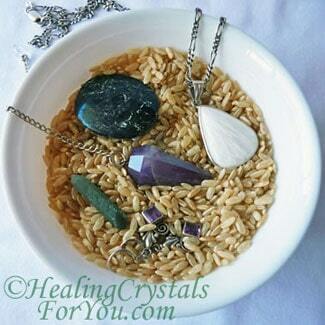 You can use any type of rice, either white or brown rice is okay for cleansing crystals, and its quite easy to do. You can use rice cleansing if you are wary of using water or sage, and this may be especially useful if you have a stone that is very precious to you. Simply place your stones on top of the rice and leave overnight. This method is very easy and simple, and you can do it easily. The rice will absorb negative energy, so you will need to throw it out after using it. It is advantageous to use a fairly flat bowl, and depending on the stone sometimes you may choose to cover it with rice. Alternatively, simply place it on top as shown in the photo. Use your intuition to decide what is best for that stone. I have quite a few Amethyst Crystal clusters, and I actually buy flat pieces specifically for the purpose of charging my jewelry. There are a number of healing crystals for you to choose between for this purpose, and many varieties of quartz can be obtained as clusters, including Clear Quartz and Citrine. At night I take off my rings and pendants and carefully place them on top of the cluster. It is also helpful to place new stones you buy, or ones you have been using on top of a quartz crystal cluster to recharge. I have a cloth over one of my clusters, to ensure my jewelry doesn't get scratched by the points of the Amethyst cluster they sit on. If you have had a stone in your pocket during the day or worn your jewelry, you could place them on top of a cluster. 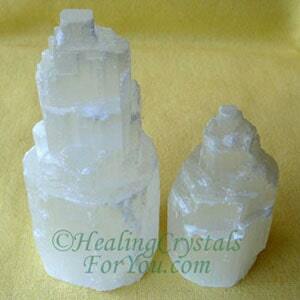 Selenite is another excellent stone to utilize for this purpose. In the case of Selenite I have flat pieces which are beneficial as they will not scratch your jewelry. You can leave them there overnight for their negative energy to be released. Cleansing crystals by leaving them there until you wish to use them again can be helpful. I have a rack that I hang my jewelry on, above the cluster, and when I run out of room I move them up onto the rack. 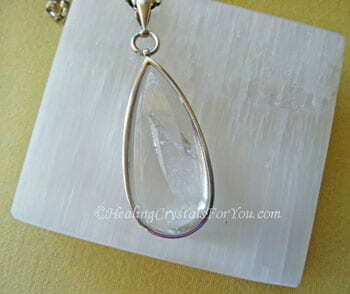 Quartz resonates very well, and the energy will charge the stones if they are nearby. You can also program your cluster to cleanse your crystals, and also to cleanse itself at the same time. While it will cleanse negativity from your stones regardless, this extra step can be helpful. If you are not sure how to program quartz, check out my article that talks about this, as it has details on how to program your stones while in meditation. I may also use running water too, for cleansing crystals that I have been wearing as well, but the quartz helps to recharge them. Having them on your body can reduce their energy levels, as they have given so much to you during the day. Make sure you regularly cleanse and recharge the cluster if you are doing this. Your cluster may easily be smudged with sage as it works well for this purpose. I have included moonlight in this section as it could be said that it is related to cleaning your crystals. The moonlight has a powerful influence that will re-energize your crystals, and allow them to lift their vibration naturally. A good time for cleansing crystals is at the time of the full moon. It is beneficial to put them out when it is at its brightest, and its energy is strongest. If you wish you can combine the use of moonlight charging with methods for cleansing crystals. Your stones will be more vibrant and potent next time you use them. They don't really need to be out in the moonlight to absorb the moon's energy. But it can be an added advantage if you are able to place them somewhere in your home where they will be in the moonlight for as long as possible. Leave them there overnight if you are able to. By absorbing the energy of moonlight, you will allow their vibration to naturally lift. Be wary of placing them where they will get strong sunlight on them, as this can fade their color. While losing their color may not have affect their energy, you may feel disappointed if they are no longer the color they were when you purchased them. "What we are today comes from our thoughts of yesterday, and our present thoughts build our life of tomorrow. Our life is the creation of our mind." The Buddha. You may also choose to bury your stone in the earth, but again make sure that you know if the stone is one that can take water, in case rain seeps through to where they are located. This is a perfect way to cleanse many stones, but do mark the spot where you have buried them so that you can find them again! You may have noticed that I don't recommend cleansing crystals with salt or with salt water. I know a lot of people swear by this method, but personally I ruined quite a few crystals by taking someones advice when first using crystals. Salt is quite abrasive, so I don't recommend using this method. It is up to you to use this method if it pleases you, but I must warn you that a lovely crystal may not be so lovely afterwards, so do it with care! Cleaning Quartz crystals is easier than other types of natural crystals as they like water. To clean quartz crystals any or all of the above methods may additionally be used. You can clean quartz crystal using running water or in a container of water. If you are not sure if the crystal is a quartz crystal do not use water. Selenite Crystals may become distorted from water, and will lose their shine or become badly damaged in some other way. Other crystals may react to water and be totally ruined. Check before you use water if the stone can be cleaned in this way. If you are not sure don't use this method. Some sellers of stones coat the stone with a sealant that may come off in water, so be aware that this can happen. As quartz is highly programmable, while cleansing it you might tell it to release and let go of any negativity within it. By programming it to release negativity, it will aid other crystals nearby to stay cleaner and may not need cleaning as frequently. While quartz is extremely easy to program, any stone can be programmed to self cleanse. This is helpful if you have a large collection that is hard to constantly get to to cleanse. Check out my page on meditation with crystals, if you are not sure about how to program your crystals. 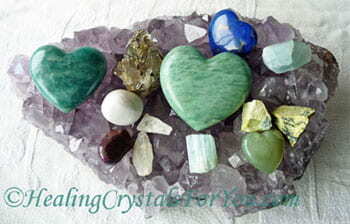 On this page I talk about placing an affirmation within the stone. While you can choose any affirmation that suits you, a possible affirmation could be something like the following... I constantly release any negative energy to ensure my vibration is always the highest it can be. You may still want to cleanse programmed stones but it is not necessary as often once they are programmed. Do Some Crystals Never Need Cleansing? 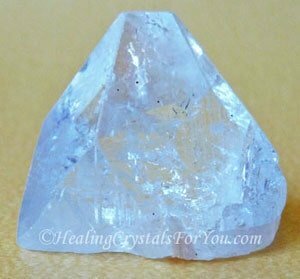 Some people say that some crystals never need cleansing, like Kyanite or Citrine, I do not necessarily think that this is entirely correct. So I cleanse them anyway as they like being refreshed and this is a helpful thing to do. If you are doing Quartz Crystal Healing, ensure that all of your crystals are cleansed regularly, to ensure the vibrations within the stones are most effective. Regular smudging of your crystals will revitalize them and lift their vibration. It is also a good practice to regularly put your crystals out in the moonlight, around the time of the full moon when it is at its brightest, to boost their energy. As a general rule cleansing crystals is necessary, even if you may not feel that your crystals have any reason to be cleaned. Cleaning crystals regularly ensures they will be at their best to assist you as you use them in your life. Keep them at their best and you will enjoy using your stones! Check out the lovely slab of Selenite below. 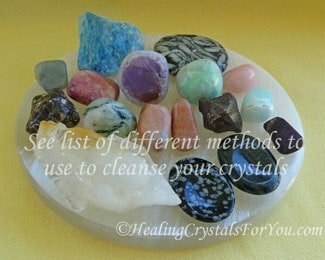 This is another way you can charge your crystals as these high vibration crystals work well to energize crystals once they have been cleansed. if you have just bought a new crystal, it is also beneficial to energize new crystals, especially if you are unsure of where they have been and if they need added energy. If you'd like to find out if I have written about something in particular on this website or if you are looking for information on a specific stone, you can find more information on the site-map page (link below). The site map page lists the names of specific in-depth articles about individual crystals and stones, as well as the list of A-Z pages with properties of crystals that have not yet had their own page written. There are also pages listed that are related to specific problems (such as crystals for weight loss and to help sleep for example). As well you will see the pages listed that have information about particular psychic gifts and crystals that might be used to boost these abilities, and some other issues you might need help with... in fact anything that is written about here can be found this way.